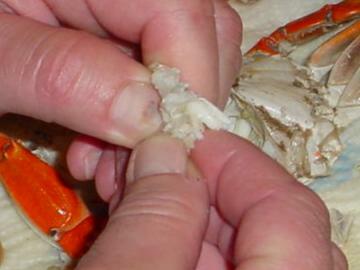 This is Crab Picking 101. First off... no knives are allowed, except a butter knife to crack claws (an old fashioned pecan cracker works good for this too). If you haven't read the introduction to this page click here. 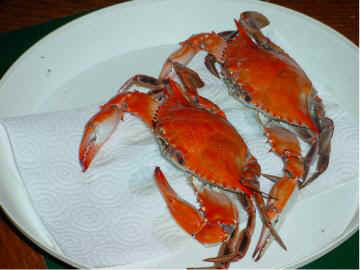 We'll start with two nice boiled blue claw crabs taken from the bayous of South Louisiana. 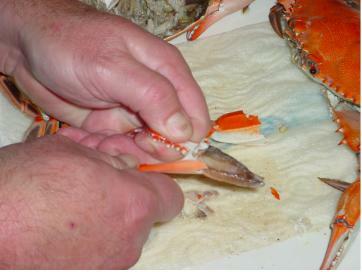 Be careful when handling crabs, there are many barbed points to work with. These were from a bushel of crabs I just boiled. Both are male and were not real fat. Why?, They were caught around the "New Moon". First let's get the claws off. Grab the claw and pull down, then out. A crab is mechanically hinged, remember that! Break both claws, and, if you happen to pull meat you know what to do... slurp! Do not remove the other legs and don't be tempted to grab and jerk the flippers out hoping to get the lump meat out. 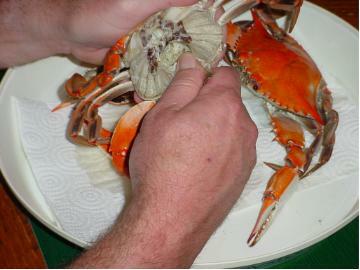 Grab the legs as a cluster and grab the end of the top shell and pull apart, it's real easy. Next part is getting the "innards" out. Using your thumb, grab the entire mouth section and pull it down and away. 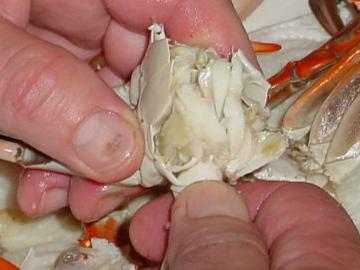 This is the "top" of the crab, remember that. The lungs go next. Again using your thumb, drag your thumb along the lung part nearest the legs (where they are attached) to scrape away the lungs on both sides. Now you want to remove the "apron". 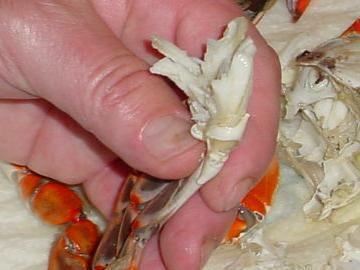 That's the part of the crab that determines if it's male or female. Here I take the point of a leg and slip it under the apron tip to lift it. Once lifted just break it away. 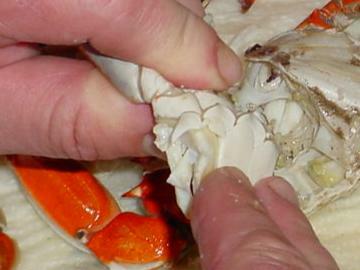 This is the "bottom" of the crab, remember that. If there are remaining "guts" in the middle simply swoop them out. 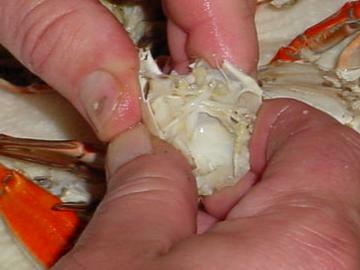 In the females (naturally) there may be a small amount of eggs in and around the gut and under the front of the shell. There may also be fat accumulated in the same areas. If you don't eat either one of these delicacies please save them and email them to me at your earliest convenience. 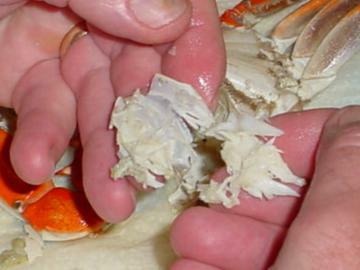 Once the center is cleaned, hold the crab as shown (top up) and break it in two using your thumbs to first push it inward (like you're going to fold it) then go the other direction to break it in two. So now I have one half of the crab in my hands. At the bottom is the flipper section. The top is where the claw knuckle was and I broke that away. I must orient you further here. To the left is the bottom of the crab and to the right is the top. 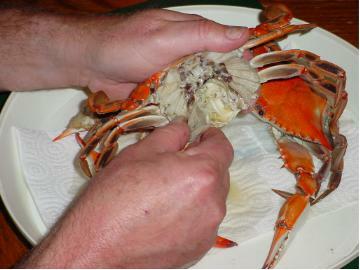 In your mind split the piece of crab you see here vertically (up and down). To the left (lump meat), to the right (pieces). 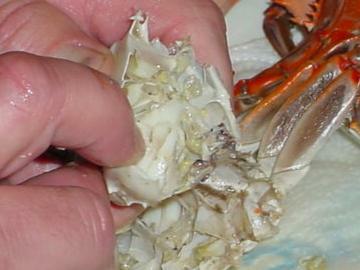 With your index finger (as shown) pull away the shell around the flipper meat. This will be the bottom part in the picture. 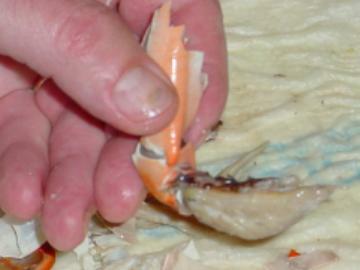 This picture shows the shell broken away and I'm grabbing the flipper itself and pulling up and away. Notice beforehand I never said anything about removing the legs, they give you a mechanical advantage! You need them as handles through almost every step. Here's the result. 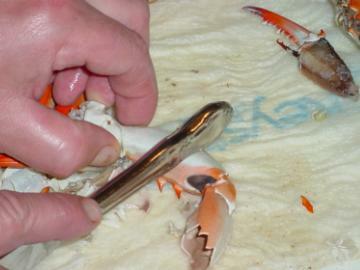 A fine cluster of lump meat with a handle that you can use to dunk that "crab popsicle" in your favorite dip. 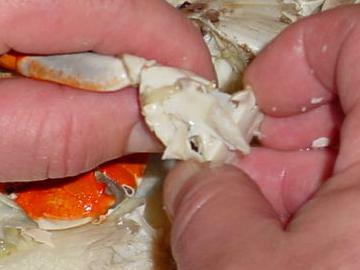 Many folks try to just yank the flipper meat out and they wind up with the flipper in one hand and meat still in the crab. Then it's a fight to get the knuckle loose. Now we have the lump, or flipper, section out (at the bottom) and the claw knuckle out (at the top). We're now going to break this piece in two by holding it as shown and pinching it together. Pinch it inward, then in an imaginary line top to bottom, pull it apart (like opening a zip lock bag). What you'll have is the half on the left separated from the half on the right. We'll work next with the left side. Hold the legs in one hand and push down as shown with your fingers. It will act like a hinge. Continue the motion until you get to about a 90 degree angle. Grab the points near the legs (as shown) and gently pull them away. Presto change-o more lump crab meat. Neat huh! Now you may have to pull a small shell or two away but hey, it beats the alternative! 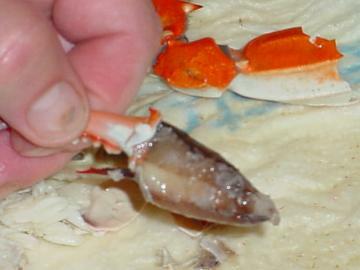 This is the last part which is the other side of the split (top of the crab where the lungs were attached). This part has a little meat surrounded by a lot of shell. Solution! Don't peel... squeeze! From the bottom (near the leg section) just pinch it to get the remaining meat out. This meat! Shell to the left, meat to the right. Lastly the claws. Here I'm using a butter knife. You can do the same thing with old fashioned pecan crackers. 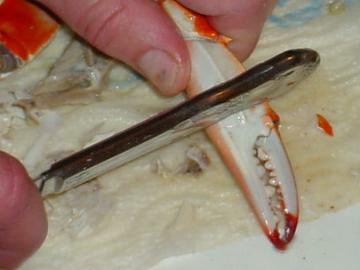 Strike the claw near the pincer hinge, be sure it has cracked. Flip it 90 degrees and do the same thing. Continue cracking all the way around. 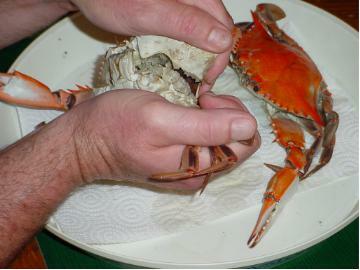 Note: if the crab is stuffed full of meat you want to continue to crack it towards the first joint to loosen the meat. And believe me this won't always work. Grab the larger part of the claw with one hand and the pincer end with the other and using a back and forth motion work the pincer away from the main claw. Now break the claw hinge by opening the claw then pushing down. I'm pulling up with my left hand and down with my right in this picture. If you just continue to open the claw you crush the finger meat. This is (if you're lucky), the result. 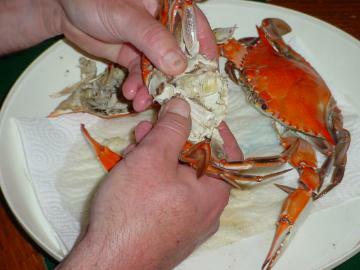 If the crab is packed with meat you may have to dig the remaining meat out with the butter knife. In the center of that fine looking piece of meat is a feather-bone so be careful when you go to devour it! 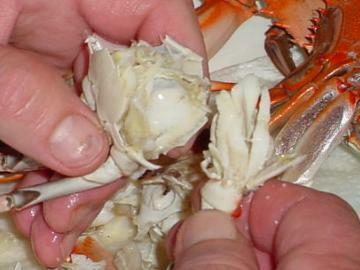 The back side of the claw is struck right behind the first joint on both sides. 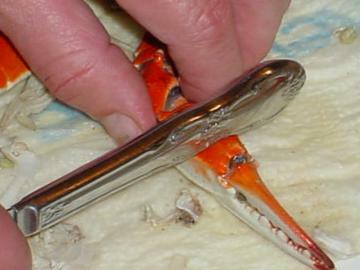 Again, if the crab is super stuffed with meat this will become a challenge that can be managed with the knife. This is the result. Again there is a feather bone inside so be careful. 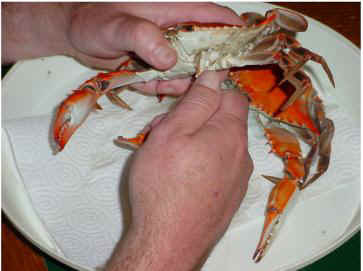 Well, that's the last of "Crab Pickin' 101). 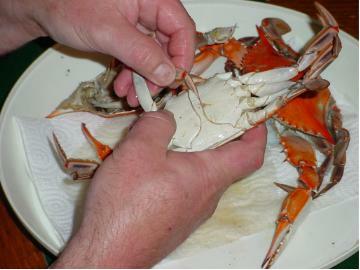 Oh, here's the link to the Blue Crab information site! (click here). Lot's of knowledge about the poor ole' crab here!